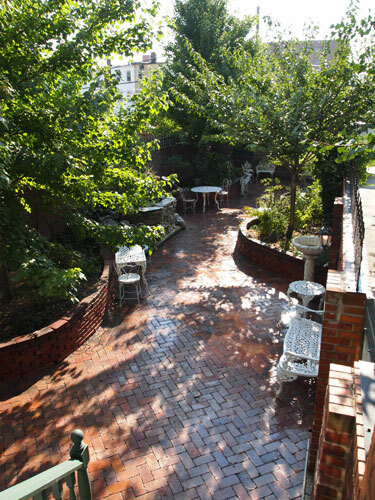 My dream for our backyard was that Ron would pave the entire thing — 65 feet by 20 feet — in vintage brick. Mind you, this was not Ron dream. Laying brick, on my hands and knees, for days on end! No, sir.The task was daunting in a dozen ways: we’d have to find hard-to-find, old brick, 3 tons, to be exact, then transport it, and then store it while Ron worked on the yard. You can’t store that stuff on the sidewalk. More daunting for Ron was the issue of leveling the yard so that the bricks would lie flat and drain in the right direction. 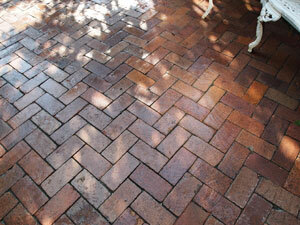 Most daunting was that I wanted this brick laid in a herring bone pattern, the most difficult design. And then there was the issue of cost: bricks aren’t cheap, running at $1 – $1.50 a piece. We’d need about 3,000. I told Jill that maybe I’d get around to this in 3 or 5 years. Funny thing about the way we live, Ron and I never know when happenstance will change my mind or his or both. We happened to be at an architectural salvage yard recently when we came upon piles of old brick for the rock-bottom price of 25 cents a piece. “We’ve got to get this brick,” Ron said. I beamed agreeably. Several trips later, we had about 500 bricks, enough to do the middle section of our yard. Ron said he’d lay this down, we’d see how it looked, and then in a few years, he would finish the job. You see where this is going? Our contractor friend, Nicholas, AKA “The Essential Handyman,” offered to help Ron. Nicholas is a much neater, much more exacting builder than Ron, which Ron freely admits. He patiently watched Ron work, then made suggestions, then, by the end of the day, he was laying most of the bricks and Ron was cleaning and trimming them. Three things occurred to Ron at this point: 1) life is short, 2) Ron hates laying brick, and 3) Nicholas is much better at it than Ron — and Nicholas does things like this for a living. So we gave Nicholas the job. “Please do the whole yard!” Ron said. More than a few people have mentioned that they liked the pea gravel that covered our back yard. “It’s kind of zen,” one visitor remarked. Truth is, the pea gravel was a nuisance because those little stones got into everything, especially the treads of your shoes. We have pea gravel scattered throughout the house. It took Nicholas about a week to finish. But first we had to take up the 500 bricks we had already laid because you can’t lay just any old bricks with any other old bricks. They have to be the SAME size; otherwise, they won’t line up right. Nicholas and I found a guy who deals only in vintage brick. Our batch is 100 years old and they are pavers, not building bricks. The difference is that pavers are much harder — made to withstand horse hooves and iron wheels. We bought 3,000 of them. The seller delivered them on a big flatbed and then, using a forklift, filled our garage with them. So I got my dream in short order. And I can’t believe how beautiful the yard looks now — a totally different feel than before. It’s more “formal,” more dressed up, but also warmer. 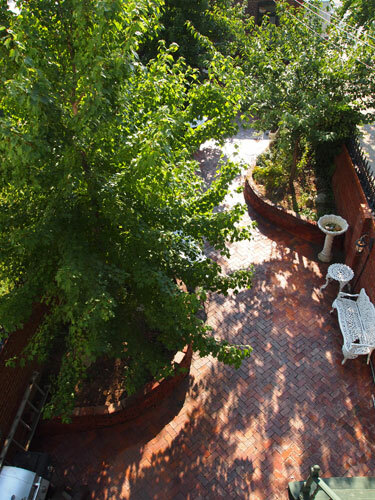 The brick gives us a courtyard feel. And they look like they’ve been there since the house was built, which is a testament to Nicholas’s skill. 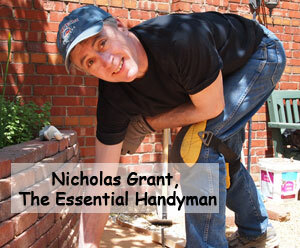 Nobody does better work than the Essential Handyman. Every time Ron walks to the garage, he glances down at the brick and shakes his head in wonder.